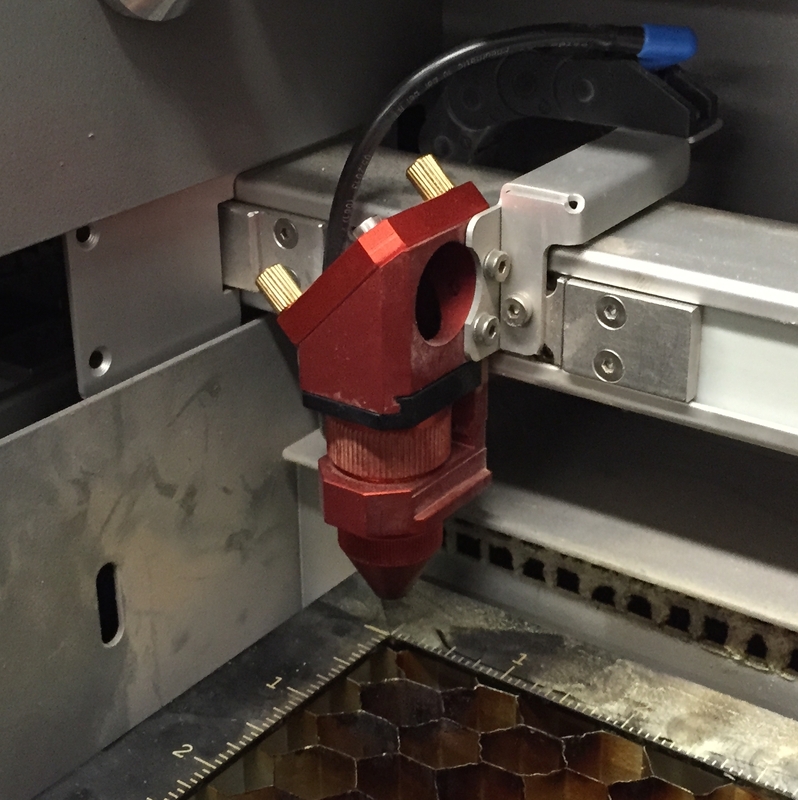 The first piece of equipment in the Digital Fab Space is our laser cutter. The laser cutter truly belongs to the Fab Lab as well, not to any specific department which means that it’s a tool for use college wide. We’ll be expanding access and posting availability and training sessions soon. Even though it’s not necessary to know all the details about the laser in order to operate it, as a science person I love knowing about the machine and some of what’s going on inside. For those of you who are also interested here’s the scoop. Our laser is a Rayjet 300 made by Trotec lasers in Austria. It’s almost identical to the much more common Trotec Speedy 300 aside from a slower x-axis motor, some different software, and a few accessories. This version is as robust as the (well-respected) Speedy 300 but is made more for applications like ours (educational) rather and purely industrial use. 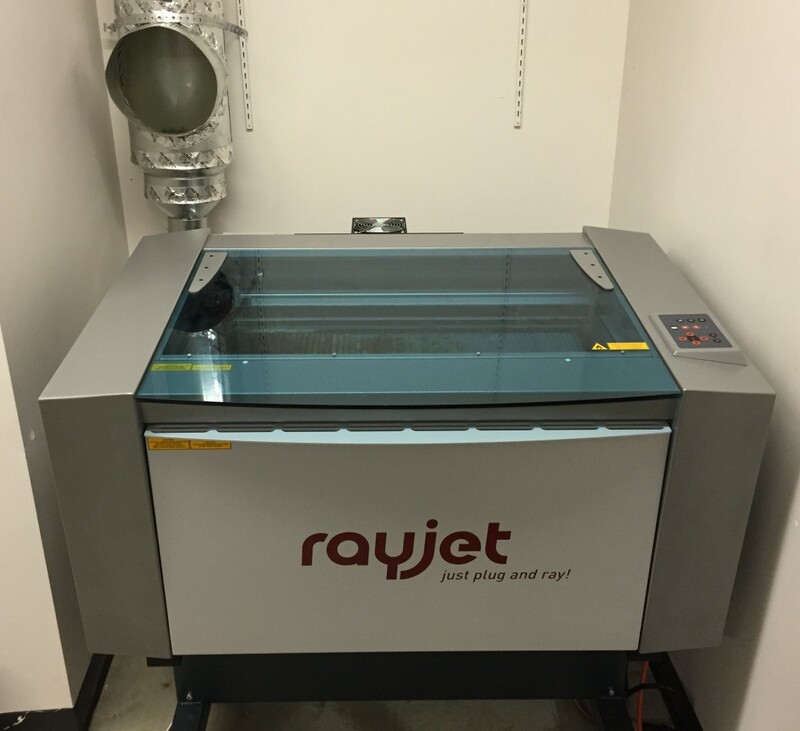 RayJet 300 80W CO2 laser. Vent is shown in the upper left corner of the photo. The laser itself is a ceramic tube 80 watt Carbon Dioxide (CO2) laser. For reference that’s 80,000 times as powerful as your 1mW laser pointer! The wavelength of the laser is 10.6 micrometers which is well into the infrared and about 20 times as long as the wavelength of green visible light. The laser is invisible but has a co-linear red diode laser that is visible to aid in focusing and positioning of the CO2 laser. The laser is reflected by three mirrors into the laser cutter bed area and then focused down into a tiny point by a single lens. The beam remains rather diffuse until finally focused so as to not damage the optics leading up to the laser head. The lens that focuses the laser is made of Zinc Selenide (ZnSe) which is one of the few materials that is transparent at 10.6 micrometer wavelengths. To protect the optics and facilitate cutting and engraving there is an air pump that pushes air out the laser head to where the cut is being made. Cutting head of the laser. The laser reflects off the angled mirror and down through the lens right above the knurled ring. It then travels (along with an air jet that comes through the black hose) through the cone onto the work. The max material size is 29.2″ wide (x-axis) and 17.2″ high (y-axis) with a maximum cut area of 17″ x 28.5″. It can accommodate materials up to about 6 inches thick (z-axis) weighing up to about 40 pounds. The x- and y-axis motors are brushless DC servo motors and use optical encoders for positional feedback. The laser knows where the head is by reading the optical encoder on the end of the motor shaft. By counting the number of turns of the shafts of each motor the laser can figure out the positioning of the head itself. Y-axis servo motor with optical encoder on the end of the motor. This laser operates open-loop so there is no feedback from the actual head itself, just feedback as to where the motor shaft is. Although this is a very high powered laser, since it’s enclosed in an interlocked space, there is no need to wear safety glasses while using it. 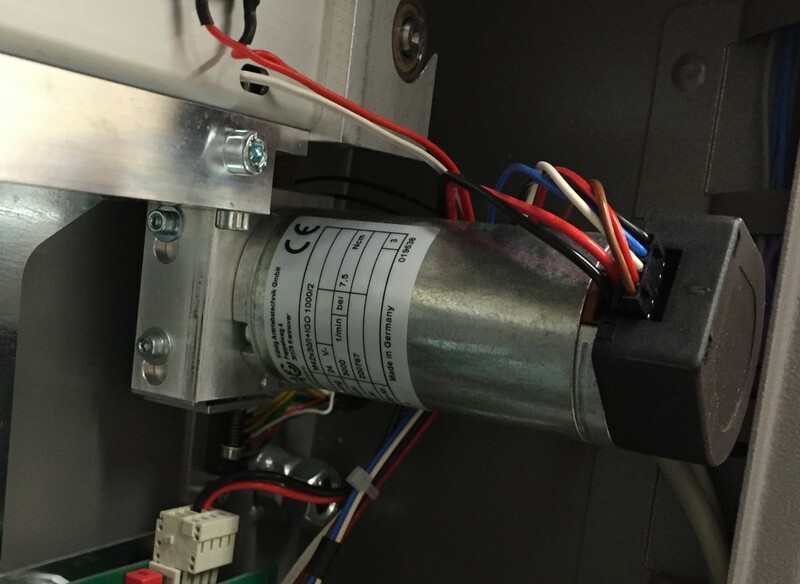 Hazardous gases are produced during cutting and engraving but they are evacuated through a vent system in the building and so there is no air quality hazard although the room may smell slightly of burnt plastic or wood after completing a project.